Tascam's built its reputation on providing high-quality recording equipment for musicians and videophiles, and now you can get a piece of the action with the compact, lightweight iM2. 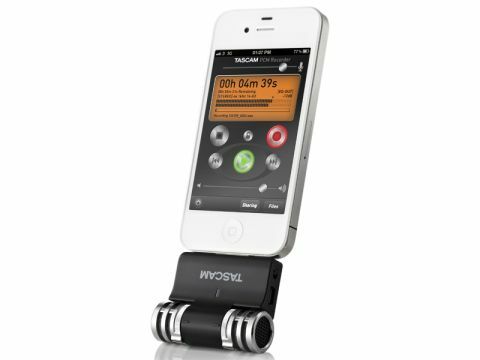 It's a digital recorder for iOS devices that plugs into the dock connector on the bottom of your iPhone 4, iPhone 4S, fourth-generation iPod touch, iPad or iPad 2. On its own, it comprises a pair of high-quality stereo condenser mics with a built-in volume input dial and a limiter switch to reduce distortion. But it really comes into its own when you team it with its accompanying PCM Recorder app. This apes the controls on Tascam's range of pro-class audio recorders like the DR-08, giving you precise control over recordings, the ability to transfer recordings to iTunes or share them on SoundCloud. Thanks to the high spec of its stereo mics and ability to record in CD quality (44.1kHz PCM), the sound recordings the iM2 makes are excellent no matter what you're trying to record. And you can angle the microphones backwards and forwards by 180-degrees to ensure they're always pointing at your subject. The Tascam iM2 inevitably picks up any sounds your hands make while you're holding it; and you'll need to be careful when setting recording levels to avoid clipping/distortion, although the limiter can help. There's also a lack of a line input, which ultimately stops the iM2 from being a great all-round recording machine.